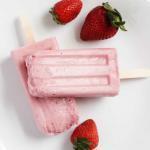 A creamy, healthy popsicle that is fruity and sweet. Great for kids, both big and small! Place all ingredients in a blender and mix on high until smooth and creamy. Freeze at least 3 hours.